Chichen Itza $15 for $30 dinner for two - via DealOn. Buy by May 5th, voucher good until 12/19/11. Tiki Ti 50th Anniversary Party / Specials Drink specials + raffles through this Saturday 4/30 4 p.m. - 2 a.m., , official party tonight 4/28 around 8:30pm - champagne toast + free coconut cupcakes from Flatiron truck to first 300 people. Toro toro toro! Note: Bar is cash only. Libra Churrascaria Brazilian steakhouse $25 for $50 in Culver City via Yelp Deals. Buy deal by 4/29 11:59am, use through 4/29/12. Exclusive Sushi Workshop with Nobu Chefs $190 - via Bloomspot. $190 includes sushi workshop admission, wine pairing, and take home sushi rolling mat. Date options: May 7, May 21, or June 4 (1-4pm). Deal ends in at around 11:30pm tonight 4/28! TripAdvisor Ticket to Anywhere Sweepstakes - Win 5-night trip for two to anywhere in the world + $1000 spending money + $100 Amex Gift Card (ends 5/9/11 11:59 pm ET). Official rules on bottom of entry page. It's not every day that a bartender is deemed by The J Gold as "one of the most interesting" in Los Angeles. Where many 'innovate' by adding new ingredients to modern classics - e.g. 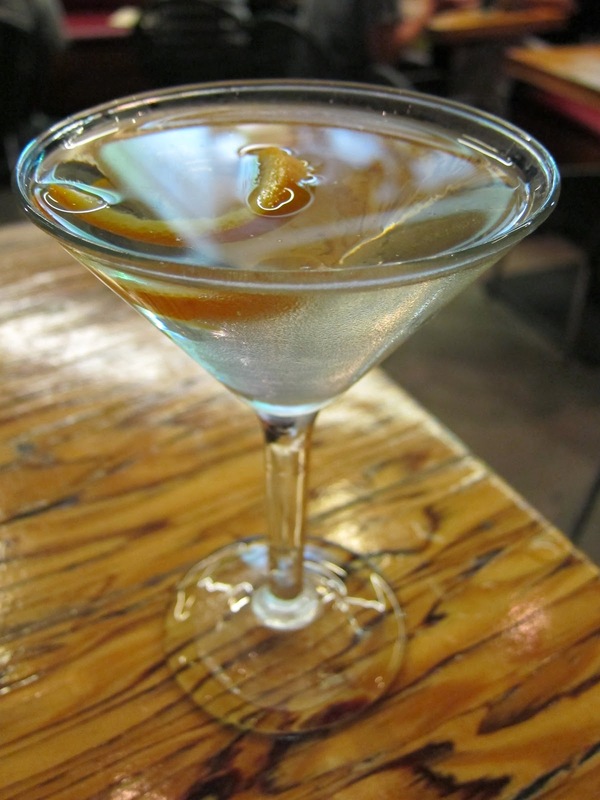 Lycee Martini instead of Appletini - Matt is literally rewriting the book on bartending with his market-driven, culinary, incredibly creative, trailblazing, yet authentic and personal approach. A self-taught talent with no experience working in a bar prior to his current role at Library Bar at the historic Hollywood Roosevelt Hotel (where "every week is like test kitchen") - Matt sort of fell into it after a stint in advertising and catering - 'winging it' after the manager took a chance on hiring him. Matt chucks the rules when it comes to cocktails, drawing inspiration instead from culinary luminaries like Walter Manzke and Michael Cimarusti, local farmers' freshest offerings, and the element that sadly too many others seem to have forgotten - interaction with people across the bar. 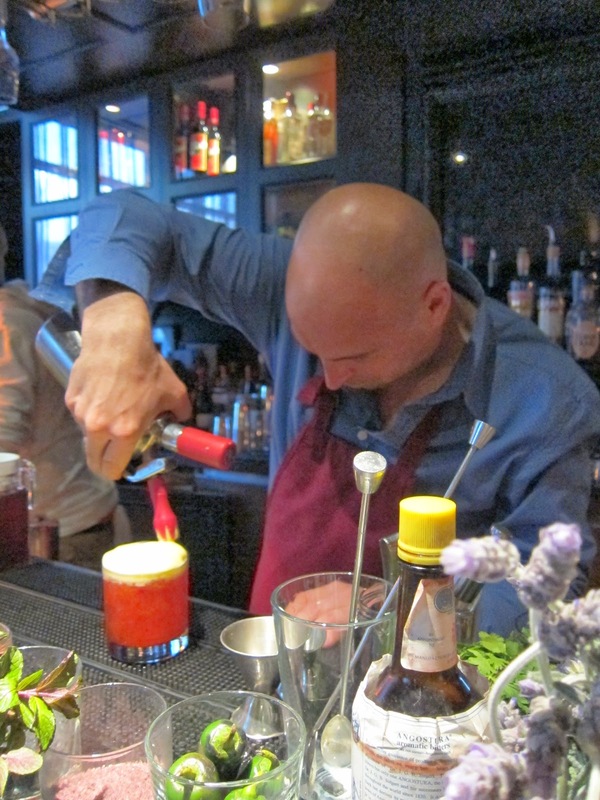 If cocktails were works of art, market fresh ingredients would be Matt's palette, and original concoctions the medium through which he creates an intense connection with patrons. 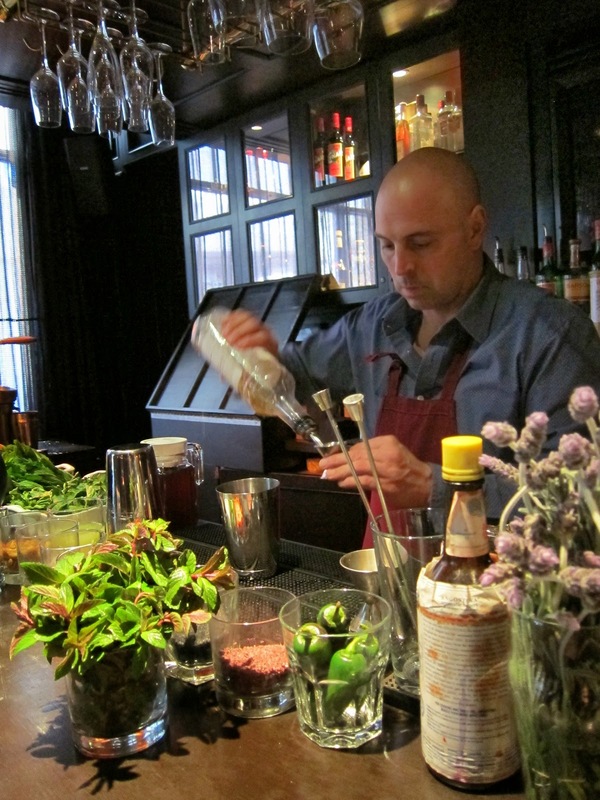 On any given day, his counter is a vision of gorgeous flora, fruits, vegetables, herbs and house made syrups, with a splash of colorful salts and spices for good measure (Matt practically lives at farmers' markets around the city!). Yet his art is not pretentious - Matt's passion for his craft is clear, and every ingredient or technique he uses is with the goal to create the best culmination of visual / scent/ texture / taste experience for his guests. We can all tell when someone is just 'showing off', but you don't get that with Matt - what you get is the sense that everything he does is because he genuinely loves / is excited by it, not because of any need to gratify ego. Matt treats the glass as an artist would his canvas, and a chef would his plate. He cares a lot about the interplay of tastes and textures, flavor profiles and visual presentation, as any chef worth his salt would. He also puts a lot of thought into naming his creations, and will use culinary terms like 'amuse bouche' to describe some of his drinks. Due to his seasonal approach, there isn't really a set 'menu' at Library Bar - so expect the unexpected every time you visit, 'omakase-style' as they say on the hotel website (love that!). In the cozy little nook that is the Library Bar, Matt takes time with guests to find out what they like before getting to work on their drink. My favorite quote, on this restorative visit on Easter Sunday, is Matt's answer to the few hit or miss feedback he has received: "you don't succeed without failing and by taking risks...truly creative people actually make more mistakes than most people because they take more risks, and I'm willing to do that". Really respect his no-guts-no-glory approach when it comes to experimenting with new things, from mushrooms to emu eggs to prosciutto to fennel to stinging nettle gin, and sometimes that means drinks that fall flat - but sometimes it leads to pure genius. Like the three drinks that he premiered for me that afternoon. 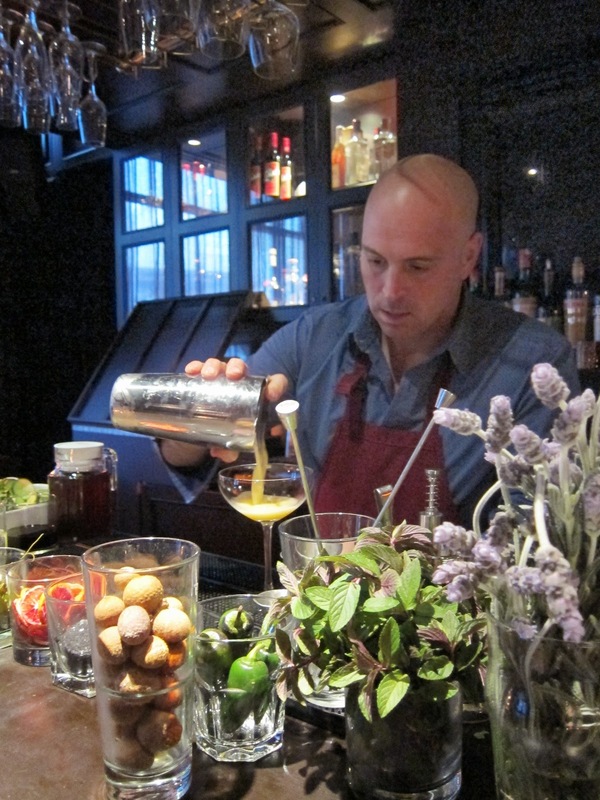 Plenty of articles have been written about Matt's signature drinks Rocket (arugula gimlet), Breeder's Cup (take on Gordon's Cup, served with oysters! 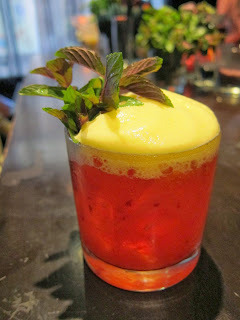 ), and Last Tango in Modena (strawberry, 25-yr balsamic vinegar, gin, St. Germain elderflower foam, named one of Gayot's Top Ten Cocktails in the US), so I won't repeat here, but I was honored to be there for the debut of his three latest creations! 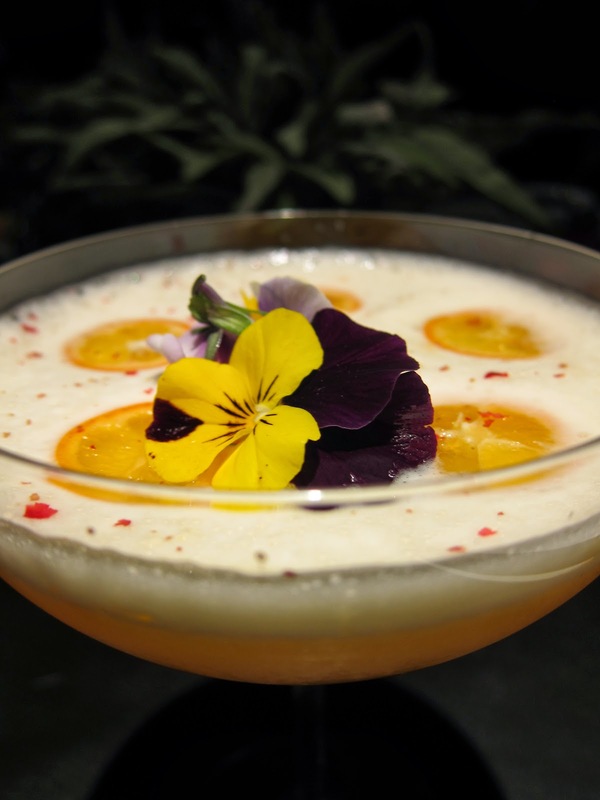 The first of these was the Spanish Rose - organic strawberries are muddled with lime juice, agave, chocolate mint and an exquisite rose geranium water that Matt made himself, and Hendrik's gin, topped with saffron infused St. Germain foam and a sprig of fresh chocolate mint. This was in a word - fantasmagasmic. I might be a bit biased as this drink contains a few of my favorite ingredients to encounter in food. But it was a sensory journey with each sip - layers of flavor gradually revealed with the unique taste of saffron in the thick, almost creamy golden foam combining with the fragrant chocolate mint hitting you first on the inhale, before giving way to a light, refreshing, faintly floral and subtly tart & sweet payoff. The sprig of chocolate mint was a little awkward to balance while tilting back the glass, but worth it for the lovely aromas it adds to the drink. Sparked by Matt's culinary approach to cocktails, I decided to play a quick game inspired by Iron Chef with him. What three things would he make if I were to give him a secret ingredient of, say, kumquat? 1. Kumquat-cello: Cut at least 1 pound of Meiwa kumquats into halves, put in jar with Belvedere 100 proof vodka, 'cook' for 30-35 days, take out & add new batch of fruit, add a cup of simple syrup and let sit for additional 30-35 days. 2. Candy kumquats (for use in Old Fashioned): Combine 2 cups water + 2 cups sugar, 40-50 kumquats, simmer 2 hours then take out so that you are left with a nice kumquat sugar syrup (one of many syrups that Matt makes from scratch himself at the bar!). To make Old Fashioned: use 1/2 oz of kumquat syrup, add 2 dashes Angostura bitters, 2 oz rye whiskey or bourbon, and 2-3 kumquats as garnishes. Dry shake to emulsify egg whites, then shake with ice and serve in cocktail glass. Garnish with thinly sliced kumquats, pink pepper and pansies. This drink tastes like a luxe getaway in a cocktail glass - clean like an ocean breeze, laid back yet sophisticated - I could drink dozens of these in one sitting and never want it to end. It was love at first sight and sip. 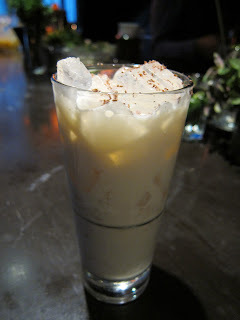 The third and final drink Matt premiered for me was Thai Chai (working title), made with chai tea infused gin shaken with condensed milk and longan (a lycee-like fruit) topped with chocolate shavings. 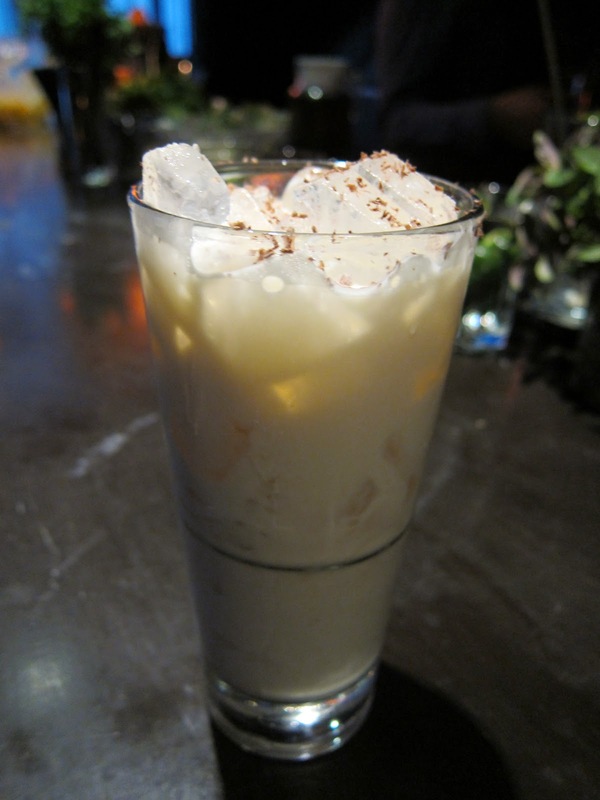 The chai tea is from Sugarbird Sweets and Teas from the Sunday Larchmont Farmers Market, and tastes amazing with the naturally sweet, tropical flavors of the longan in this refreshing, silky drink that a fellow guest described simply and joyously as "dessert"! The perfect finish to a lovely afternoon of the best, most refreshing, delicious cocktails I've ever tasted. 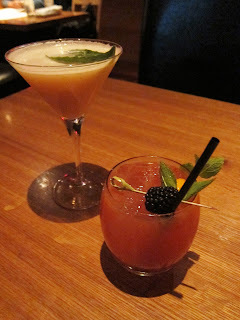 Some might balk at the $15 price tag, and drinks at Library Bar are definitely not for the faint of wallet. But consider the 'liquid fine dining' and personal, pretty much one-of-a-kind experience you are getting for that price. I've never been this excited about cocktails in general - and I'd even pay that twice over when Matt does his white truffle eggnog again! Matt's figurative new 'book' on bartending is definitely a page-turner that has me on the edge of my seat. So what will the next chapter bring for Matt? He's looking forward to summer fruits / veg to come into season - especially passionfruit - which was also the answer to my question "if you can only eat one thing for the rest of your life, what would it be?" Somewhat poetic, that Matt's favorite thing in the world is passionfruit. What are his favorite drinks to make with it? Liquid Yoga Campari, aperol, lime juice, agave and passionfruit - because it's bitter, tart and sweet at the same time, and perfect to drink after yoga. And the artist shines again with his 3 Faces of Van Gogh Cynar, Cassis and passionfruit - forming 3 faces: bitter from the Cynar, made from artichokes; passion from passionfruit; and sweet from cassis. He'd also like to have his own farm someday, keep his own bees to make his own honey. But for now - his star continues to rise, with press feature on CNN actually posted today, and high profile foodie events like Cochon 555 coming up next (partnering with Chef Tim Goodell from Public Kitchen & Bar to compete with top chefs from around the country). I'm calling it, look out for the duo to make headlines. More pop-ups pairing cocktails with dinner may be in the future. As well as a continuing barrage of interviews with TV shows, print and online media (and he's still making time for fledgling bloggers - love him!). And some other big projects in the works, not for me to mention here. So pretty much get to Library Bar before Matt becomes an international superstar - if you live in LA, I promise you you'll kick yourself later if you don't pop down to get The Biancaniello Experience while you still have the chance! 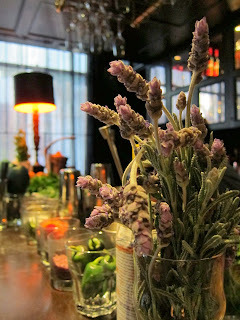 Matt is at Library Bar off the lobby of the Hollywood Roosevelt Hotel Tuesdays, Wednesdays, Saturdays and Sundays. Maybe it was because tomorrow is Easter, candy is being pushed from all directions, and even with an incurable sweet tooth, I have a Peeps hangover before my lips ever touched one. Maybe because I just scored bags of amazing locally produced small batch treats from Artisanal LA last week. But I haven't had a desire to visit candy / sweets stores recently. Until today - walking down Ventura, my feet involuntarily screeched to a halt when I came across a barely noticeable storefront - lodged in an unassuming space between a hair salon and Indian restaurant - that also peddled mass produced candy, yes, but on closer inspection revealed a cavernous treasure trove of sugar-packed nostalgia. One step inside and I felt like I was in a theme park - a dream for kids of all ages, a place designed to induce whiplash not only with its featured attractions: soda and candy, but with every detail crafted carefully to give guests an immersive experience. Everywhere I looked, I saw something that brought back sweet memories (had to do it! ), or piqued my interest by introducing me to something new - from the little pills of fizzy candy that comes in little plastic soda 'cans'? To those sugary dots that come on sheets? (And for 13 Going on 30 / incorrigible chick-flick fans, Rocket Fizz sells Razzles!!!) To Turkish taffy. 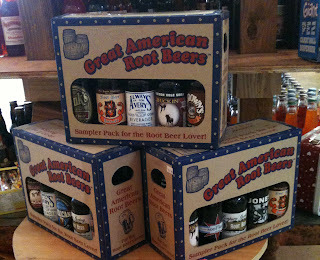 They also had row upon row of bottled sodas from standard orange to sassaparilla to black cherry flavors. All surrounded by walls lined with cool vintage 'tin' signs featuring tongue-in-cheek updates of Hollywood hits and iconic posters from the 20s/30s, to comic superheroes. While Beach Boys tunes form an audio backdrop. It was so much fun to glance through all the treats scored from around the world as well - there were Australian Style Licorice (in flavors from blueberry to green apple); Japanese treats familiar to 'kids' who shop at Asian markets around LA, but may be a novelty to everyone else: Kasugai fruit flavored gummies and all flavors of Pocky chocolate covered pretzel / biscuit sticks; and previously mentioned Turkish taffys. You can also hit up the self-serve candy bar, and make your own custom bag of taffies and other individually wrapped candies. I loved seeing some of my favorites from the UK (that formed their own food group as part of my self-prescribed 'perfectly' balanced diet as a kid): Crunchie (chocolate dipped honeycomb bar $1.69), Toffee Crisp ($1.69), Smarties (Britain's answer to M&Ms) - and Polo mints! Some new discoveries recommended by the shopkeepers were Violet Crumble ($3.99) and Kit Kat Chunky ($1.39). There were so many varieties and brands of soda that it was almost overwhelming! 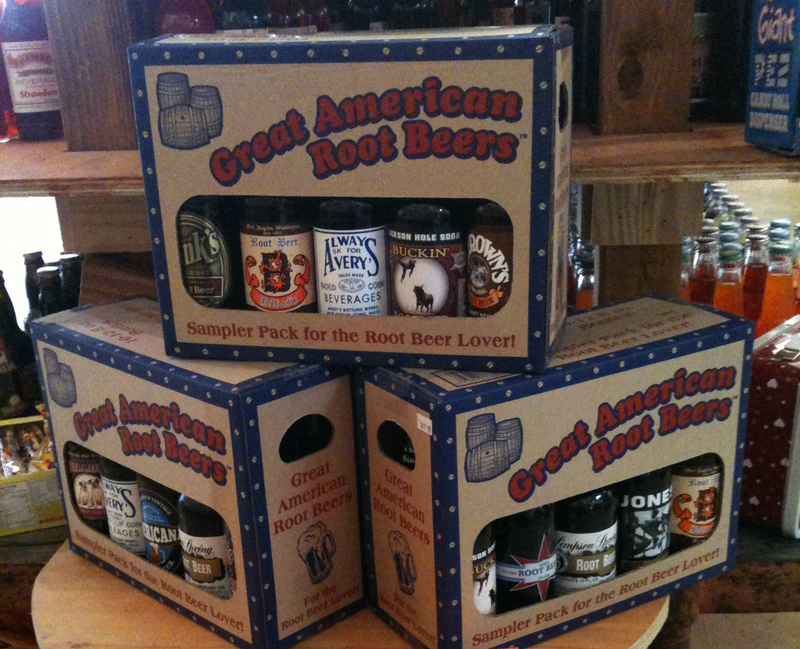 I made a mental note to remember the Root beer sampler (10-pack $17.99) as a nice, unique gift set for a friend when her birthday rolls around. Aside from nostalgic / gourmet sodas, there were also novelty ones, from Sopranos branded soda to "Gamer" soda (bottle full of win? ;)) - not sure what these really involve, and not into tasting them, but thought they were a fun part of the overall collection. Speaking of novelty, there were also some unusual candies that were fun to see, like "Ant Candy" - yes, sugar candies shaped like ants. Red ants. While at the cashier, I noticed they also had other fun non-edible but food-themed novelty items - like Bacon Strips - bandaids printed to looke like pieces of bacon! 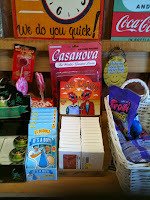 Overall, a fun time at the Rocket Fizz - will definitely be coming back next time I need a sugar fix / dose of nostalgia! Buttermilk Truck $5 for $10 of food - buy voucher for just $5 to get $10 worth of food from one of my favorite food trucks in LA! Deal ends soon today 4/21 so hurry! FIJI Water Delivery 30% off - discount on one-time orders this weekend only! Use code APRILWKD at checkout. On a weekend when most Los Angelenos have left the city en masse to answer the desert call of music mecca Coachella, foodies were drawn to the beacon of budding culinary rock stars, by the beach in Santa Monica. A fan of Artisanal LA since its first pop-up last year, the Spring Show at the top floor of Santa Monica Place represents my third foray to the ever impeccably curated indie event supporting local food producers, artisans and educators. This is one show that always has me excited, as a place of discovery - walking down the aisles gives me the same thrill I get when travelling, and wandering around the city, knowing what areas I wanted to visit but then letting places, people, amazing things reveal themselves by happenstance. There were a few must-stops on my event itinerary of course, but for the most part I went in (with 'Designer Cyclist', her hubby and crew for the first time) open to new experiences. One of the reasons I love Artisanal LA so much is because every exhibitor seems selected because they are passionate about their craft, and about their part in the community as well as being conscious of their responsibility to the environment. It feels great to be able to chat with them to hear their stories of how they came to do what they do, inspiration for their products, and often personal recommendations on how to use them. The first stop was the perfect start to the show. 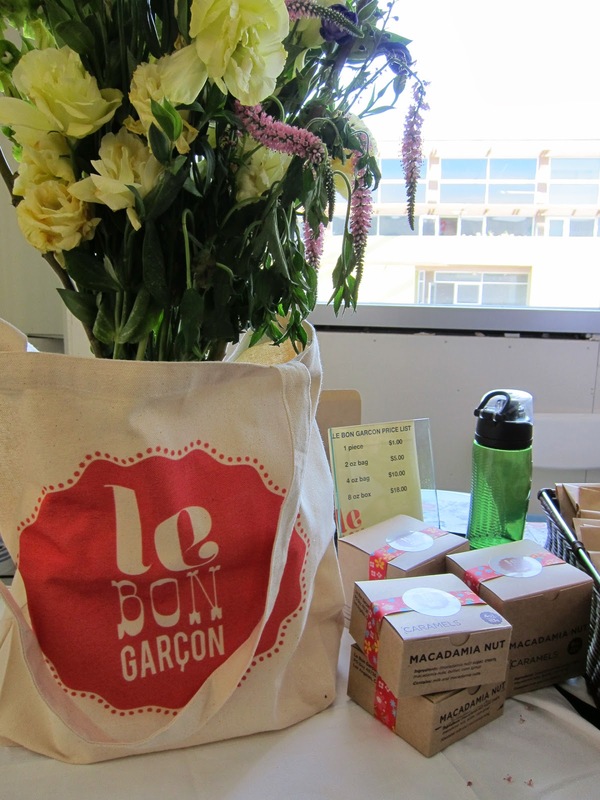 Le Bon Garcon offered samples of their small batch, handcrafted french style caramels that were incredibly buttery and nuanced in flavor. Our group unanimously nominated the Mango-Passion as our favorite, and three of us left with bags/boxes ($5 bag / $10 box). Another highlight: Bangers & Smashed - gourmet mashed potatoes sold by the pint. They didn't have the black truffle flavor to sample, but had 5-6 others including goat cheese and sage, which was rich, creamy and delicious. Loved their bold British theme, union jack and all. Also loved owner-chef Jill's title: "Food Anarchist"! When asked what this involves, she said a food 'revolution' - changing the way people think about a traditional, simple, comfort food and taking it to a whole new level! SQIRL was a must-stop for me, for their handmade jams, jellies and marmalades made from locally sourced fruit with unique flavors like Kumquat Chamomile, Moro Blood Orange & Tongo Vanilla Bean (I was curious to see if this tasted like a more sophisticated Dreamsicle!). At first $16 a jar may seem pricey, but when you hear that owner-chef Jessica slow cooks everything over 3-4 days, uses minimal organic cane sugar and natural pectins, and sources everything she uses locally from fruit to copper cookware, and after you take one taste, it will all make sense! I bought a jar of Kumquat Chamomile marmalade for its unique flavor profile - and was pleasantly surprised when Jessica said every purchase comes with a free tote bag, designed and screened by a local artist! The bag definitely came in handy for carrying all my purchases from the show. Don't leave without stopping by this booth - after one taste of Jessica's jams, jellies and marmalades you will want to squirrel some away back home as well! Plush Puffs all-natural gourmet marshmallows wins for most fun interactive booth - you could roast your own marshmallow samples over burners right at the table! I LOVED the Maple Bacon marshmallow (maybe it's the 1/3 Canadian in me - maple brings back great childhood memories. And of course I love bacon almost-anything!). 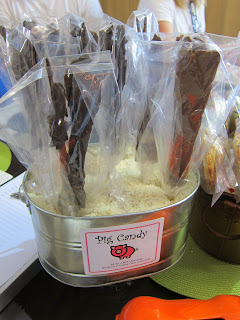 Other delicious sounding flavors also on offer ranged from Chocolate Chipetta to Strawberry Hibiscus. Plush Puffs was recently featured on Kids in the Candy Store on Food Network (I think it actually aired Saturday night?) - so Plush Puffs is definitely one to look out for, they will be the next big breakout stars! 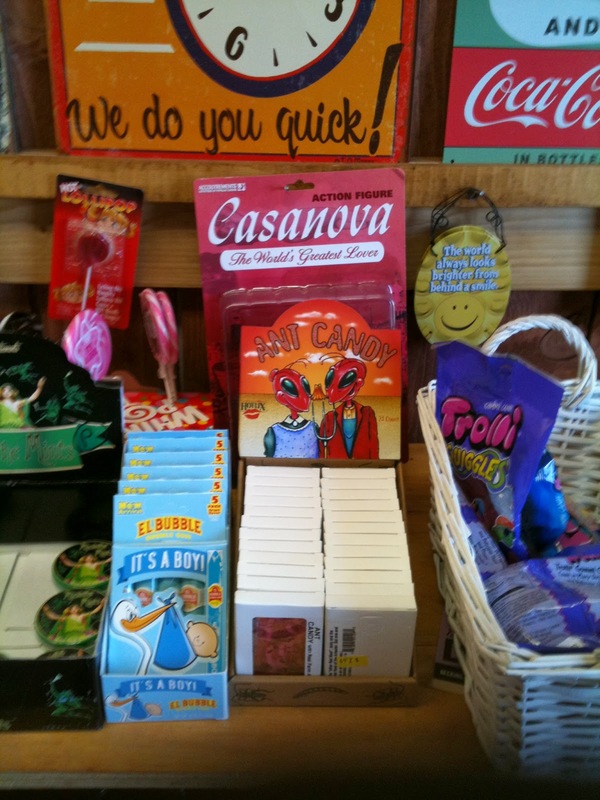 Score their marshmallows at special show price $6 per bag / two for $10. 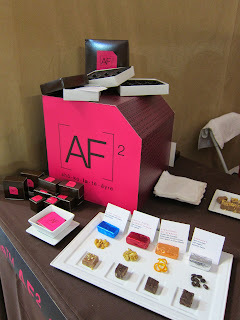 AF2 / Auntie Fruf's Aahsome Fudge - I normally associate fudge with crumbly, dense bricks of sugar without very much actual taste, which was why Auntie Fruf's velvety, relatively light, bite-sized fudge made with flavorful ganache came as such a pleasant surprise. 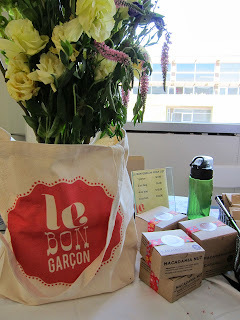 Also loved the simple but cute packaging. I left with a combo pack of the Milk Chocolate Peanut Butter and Dark Chocolate Espresso flavors (Pack of 2 =$3). 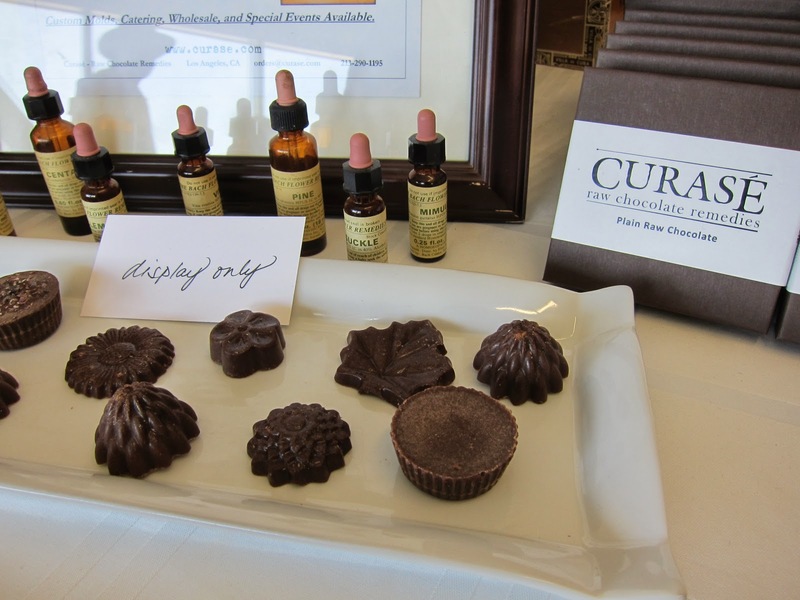 Curase as a concept didn't sound appetizing to me at all - raw chocolate remedies sounded medicinal, and to me chocolate by nature should be left as an indulgence, not made to serve any function other than pure enjoyment. Also, pretty much the only time I am turned off by the word "free" when it comes to food, is when the word comes after a critical ingredient that makes it good (e.g. "sugar free", "fat free", "dairy free") - so when I read that Curase chocolates are "sugar free" and "dairy free" I really read that as "taste free". 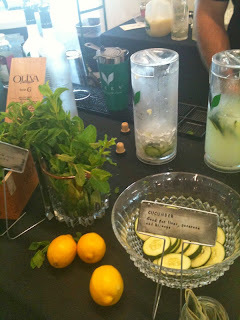 However, it was an interesting concept, and as they were sampling at the show - this would be the time to try it. So I kept an open mind and stepped up for a taste. Turns out the remedies are more like 'stress relief' (lavendar), 'guilt release' (pine) and not less appetizing things like fight congestion, or osteoporosis. The chocolates came in sophisticated shapes, and didn't taste at all herbal - the sample was actually pretty delicious! Also, something about chocolate as 'cure' made me think of Harry Potter. 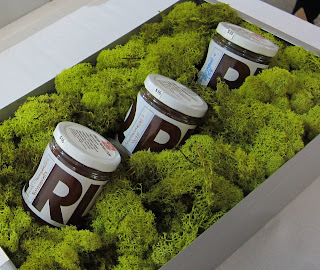 So, I liked the chocolates, and bought a small box. Update 4/22/11: In the spirit of full disclosure, at the show the samples were chip-sized and were fairly tasty. I just opened and tasted the box of full sized chocolates, and am disappointed to report that they were simultaneously waxy in texture and hardened, bland and did taste like health-food-flavored-as-chocolate (similar in concept to flavoring cough syrup to get kids to drink, but the kid can totally tell it's cough syrup made to taste a bit better than medicine, but still not something they would crave or choose to drink). At past Artisanal LA events, speakers / demos have been a highlight, with a track record that includes caviar tasting by Petrossian, and an impressive live demo of how to butcher an entire pig featuring dynamically paired Chix with Knives and Lindy & Grundy (who have since successfully launched their own butcher shop!). This one was no exception - we were torn between the Market Fresh Cocktails demo with Matt Biancaniello of Library Bar at the Hollywood Roosevelt Hotel, and a Bread Making workshop, which were unfortunately held at the same time. With many drinkers in our group, we decided to go with the cocktails, and it proved to be an excellent choice. Matt is incredibly knowledgeable and passionate about his craft, and shared his approach to creative bartending - shopping at and being inspired by farmer's markets, his philosophy is similar to top chefs' - the drink menu, like a chef's menu, should be seasonal and take cues from the freshest ingredients available. Accordingly, he doesn't really have a set menu at the Library Bar. Matt mixed a few samplers live for us that involved kumquat / lavendar / heirloom tomato syrups, and tepin pepper infused liquer / stinging nettle gin - all were amazing. 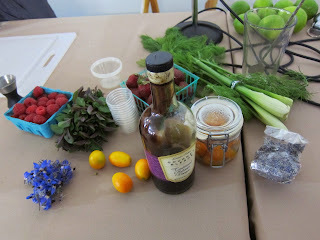 He also showed how you could get creative with presentation - hollowing out a strawberry to use as shot 'glass' for liquer. We all wanted to head straight from the show to the Library Bar (and I wanted to move into it immediately). For those who want to go when Matt is mixing - he is usually at the Library Bar Tuesdays, Wednesdays, Saturdays and Sundays. 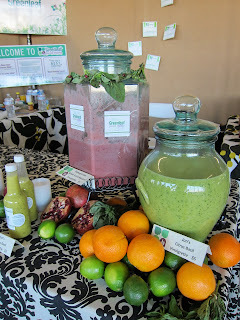 On the subject of alcohol, VeeV was on hand all day to pour a very refreshing alcoholic spa cooler, that tasted market fresh as well, and a cranberry lemonade. 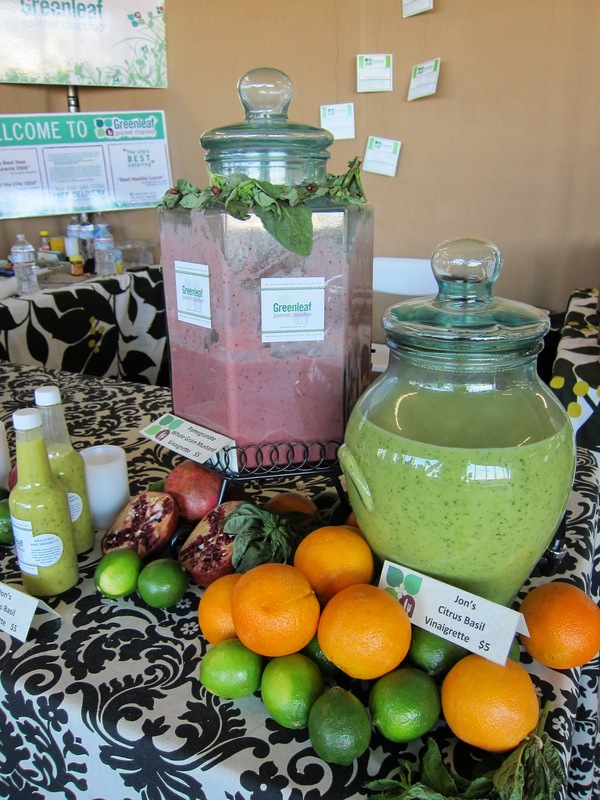 Green Bar Collective is a returning vendor that provided samples of their organic liquers from spiced rum to those infused with jasmine and hibiscus. 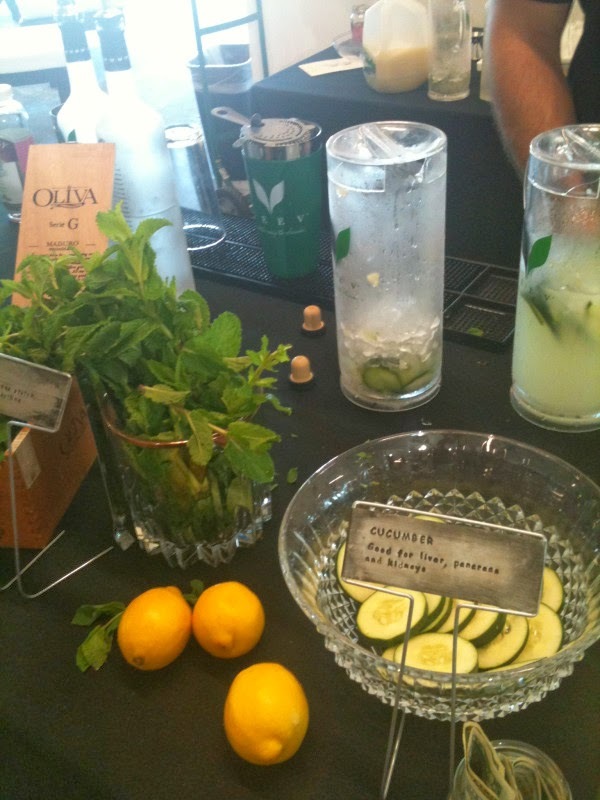 As for non-alcoholic drinks, Intelligentsia hosted a hot & iced coffee bar (loved the brew that didn't even require any sugar - and I ALWAYS put sugar in my coffee! ), Honest Tea provided free bottles of their white peach tea, and Dry soda sampled their gourmet sodas like Blood Orange, Rhubarb, Lemongrass and Lavendar. With so many great eats / products to check out, it can be a bit of sensory overlod for one day, so I'm going back to check out the ones I missed - but on my way out on Saturday, I nearly got whiplash when I saw Pig Candy at Cakes Suzette's booth - baked strips of bacon dipped in chocolate, on a stick. They offered milk chocolate ($4 for two) or dark chocolate with pralines ($4.50 for two). So, though my shoulder was almost about to snap with the weight of all my purchases for the day, I couldn't leave without grabbing one of these. Cakes Suzette also has a Mallomore, their original creation made of organic graham cracker crust and homemade marshmallow, that they offered in Maple Bacon flavor. Almost last but definitely not least, I had to stop by best-of-show Creme Caramel LA to have Designer Cyclist try their bread pudding and creme caramels, and to stock up on their amazing bacon bread pudding (with crunchy crust drizzled with sweet caramel sauce, balanced by savory / salty bacon pieces, yielding to soft, fluffy bread pudding below). All served up by lovely owner-chef Kristine De La Cruz. They were sold out of almost everything by mid-afternoon, so those going today, hit up this booth first! Another booth I stopped by at the end of day, only because I already know I love their products, was Cast Iron Gourmet - Rashida's bacon chutney continues to be amazing! And now they are also selling Bacon Fat in a jar (by popular demand)! Aside from great eats, Artisanal LA also had great body care products that smelled good enough to eat (e.g. Klean Spa's Yuzu / Pomegranate-Fig body scrubs / lotions and Fern 'N Fig body polish), and wine bags with attitude by Saucy Sacks. All in all, another rockin' event and a great deal - full weekend of entertainment / good eats for $18 (presale weekend pass price). Those who didn't plan ahead - you can still check out the show for $15 at the door Sunday, as long as tickets are still available. And, on Sunday you can save on parking as most streets are free to park in Santa Monica (of course, check signs in the specific area to be sure). Valet is also offered at the mall, for your car or your bike (bike valet is free, car valet is only available for 3-hours free with restaurant validation). For a helpful real-time parking availability tool, check out the free Parking in Motion iPhone app. You will only find foodie friendly deals / sweepstakes I think are interesting here. I hate time-wasters like 'sign up for sample of gum', that's not worth the cyberspace it sits on. La Sandia - Santa Monica Place - various deals! 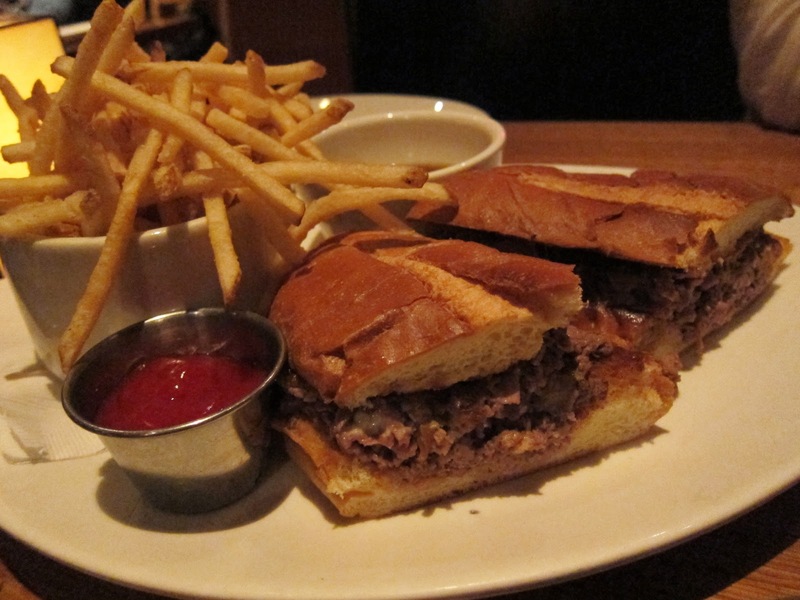 BLT Steak - De-stress after Tax Day with 50% off all alcoholic beverages all day Monday, April 18th! 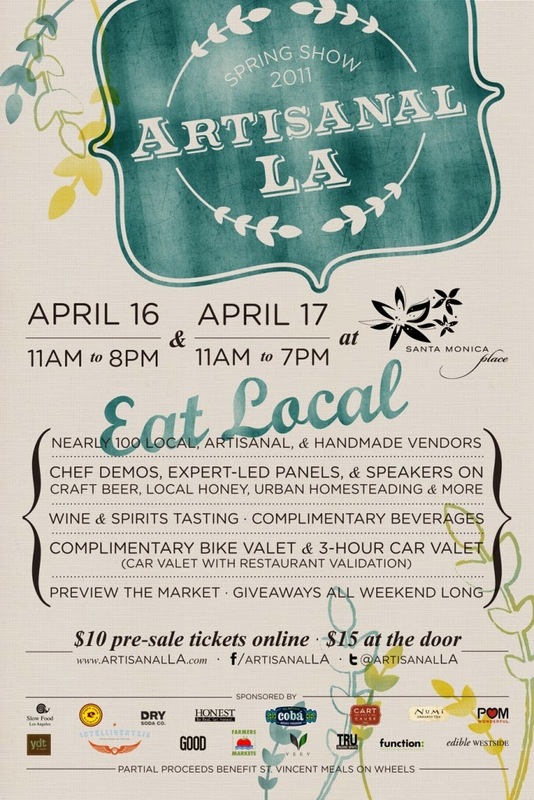 Countdown to Artisanal LA Spring Show - This Weekend! Possibly even more than any other week so far this year (ok except maybe for The Gold Standard weekend) I'm really looking forward to the work week to end. 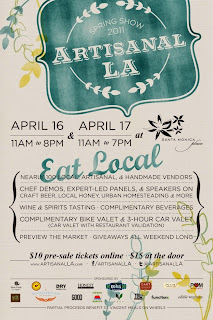 Artisanal LA's Spring Show is only a couple days away! Self described as "a weekend long community event celebrating the city’s finest local, sustainable and handmade edibles" where you can "Taste, shop, sample and learn while supporting the local economy and local artisanal vendors," it's hard to believe that the little indie / underground event that started as a pop-up just mere months ago, in the penthouse of the Cooper Building downtown, is now going big time to make its mark at Santa Monica Place, even offering with the event a preview of the highly anticipated gourmet food store The Market. The concept is fantastic - basically an incredibly well curated list of local, sustainable, artisan food producers and purveyors of handmade goods put their passion projects out for guests to taste, try and/or buy. I love hearing people's stories, about where the goods / eats came from, their inspiration, and recommendations for how to use their wares. There are also carefully selected beverage makers mixed in for good measure. You can read more about my experiences at the inaugural show as well as their Holiday show last year, both huge successes. Creme Caramel LA - fell in love at the Artisanal LA Holiday show! Amazing bread puddings: love chocolate and of course, bacon flavors. Also love their creme caramel (flan) - all the flavors are delicious! 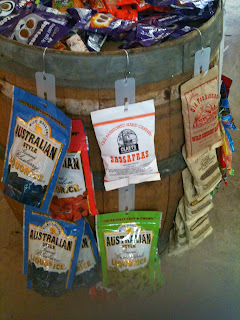 Cast Iron Gourmet - three-peat Artisanal LA vendor - must stock up on their addictive bacon chutney!!! ChocoVivo - loved from first show - stone-ground, whole-bean, dairy-free hot chocolate mixes!!! L'Artisan du Chocolat - glad to see the silverlake boutique expand to the upcoming The Market! Warning: their luscious chocolate truffles infused with everything from basil to anis/honey are addictive! Anca's Romanian - I've never had Romanian food and am curious to try! 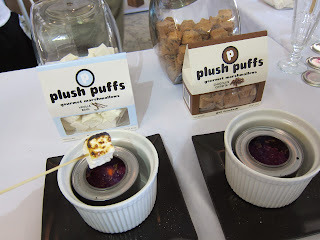 Plush Puffs Gourmet Marshmallows - not sure if they'll have these flavors at the show, but maple bacon and orange honey marshmallows from their website sound amazing! SQIRL - wanna try their local, sustainable, organic marmalades like Kumquat, and to see if Moro Blood Orange / Tonga Vanilla Bean tastes like a more sophisticated Dreamsicle! Eri Sugimoto - the pottery at their Etsy store looks beautiful! Bangers and Smashed Gourmet Mashed Potatoes - pretty much had me at "Black Truffle Smashed"
Also looking forward to the workshops, demos and panels throughout the day - especially the Market Fresh Cocktails and Bread Making ones (though they are happening at the same time :( )! Tickets are just $10 for one day admission or $18 for a weekend pass (pre-sale), $15 at the door. Either way it will be the best $10 / $15 / $18 you've ever spent for a foodie event in LA - but of course you still have time to save $ by buying your presale tickets here! Note: those weary of traffic and parking being a 'cluster'...valet is offered at the mall, for your car or your bike (bike valet is free, car valet is only available for 3-hours free with restaurant validation). So "Journey to the End of the Earth" might be just a bit of an exaggeration, we did not travel to Antarctica afterall, but it certainly felt that way this Thursday when my coworker ("Most Deserving of Directorship") and I made the trek from Burbank to Westside Tavern in West LA during rush hour. She took a chance on the freeway, which was uncharacteristically clear; I took local roads which ended up taking an hour and a half. Smart move, I know - but we had heard amazing things about the place, which sounded like the perfect spot for us to unwind after a seriously stressful work week that had yet to officially end. We expected Westside Tavern to be a great balance of sleek yet casual, with refined yet 'accessible' drink and food menus- and it didn't disappoint. Tucked away on the ground floor of the less-frequented side of Westside Pavilion shopping center (across Westwood Blvd, by Barnes & Noble, under Landmark Theatres) - Westside Tavern at first glance does not seem like a welcoming place, with its entrance essentially a solid block of wood with a narrow opening leading to the recessed hostess desk. However, this quickly opens up into an expansive, sleek but comfortable space with a wall-to-wall bar up front, leading to 'stadium' tiers of wood panelling, tables and rounds of semi-circular booths with black-padded seats up top. The arduous trek through the city and the half hour wait for a table (well, for Director, since I arrived totally late! Westside Tavern does not take reservations) is rapidly forgetten as we sat down to look through the whiplash-inducing drink menu. All the cocktail descriptions looked delicious, it was really hard to choose. They also have a substantial list of craft beers, but not being beer fans we completely ignored that list. I finally picked the tall martini glass of sweet/savory sublime: White Peach & Basil Gimlet ($11) with Pressed Basil, White Peach Puree, Dry Gin, Lime Juice, Pasteurized Egg White. This was smooth and easy to drink too many of, with the egg white adding a light froth - and the basil leaf adding both visual interest and intoxicating savory taste and fragrance to the concoction. Director went with The Rum Runner ($11), a beautiful and well balanced tumbler of Barbados Rum, Blackberries, Banana Liqueur, Lemon & Orange Juices. With the (critical) beverages all squared away, we turned our focus to the food menu, which was also filled with gourmet sounding, but unpretentious, listings that had us drooling on sight. At our friendly server's recommendation, we started with the Farmstead Cheeses & Cured Meats Board ($16) with Cashew Butter, Quince Jam, Mustard, Pickles. 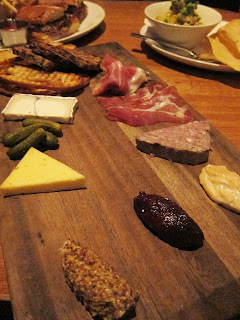 Loved everything on this plate from the charcuterie to the cheeses and breads - we were so distracted by the sounds of our own gorging that I didn't even remember to note the name of each item. The only one whose name I remember was the Humboldt Fog cheese, lush and beautiful with a vein of savory (edible) vegetable ash running through the creamy slice. Next up was possibly my favorite dish of the night: Shitake Mushroom & Asparagus Flatbread ($14) with Nueske’s Bacon, Fontina, Truffle Oil. 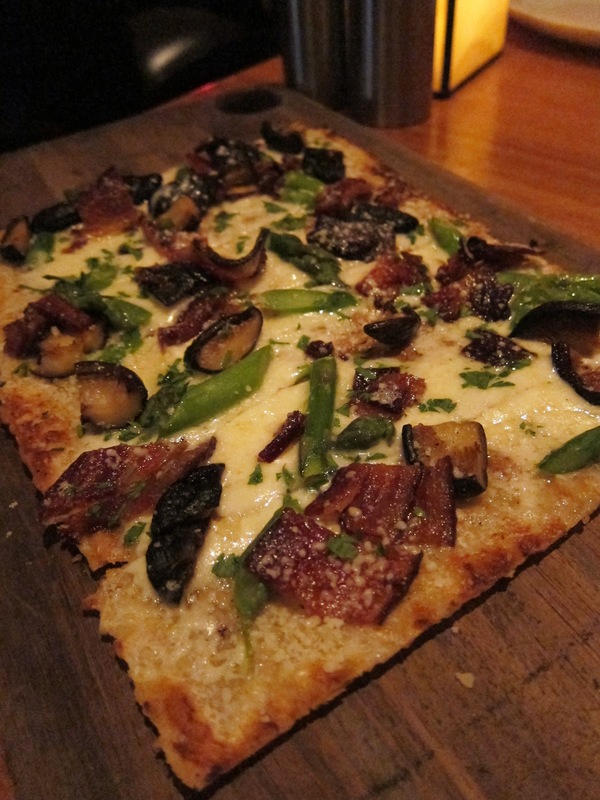 Loved the playful combination of tender, earthy mushrooms with chewy, salty panels of bacon, warm, yieldy cheese and crunchy asparagus on a crisp flatbread. And it goes without saying, the truffle oil took this whole contraption over the top for me! I couldn't scarf it down fast enough. The minute we saw "Today’s Crudo/Ceviche/Tartare ($14) Intuitive Flavorings", we knew we had to get it. And that Director appreciated the element of surprise made me realize that she's going to be one of my favorite dining pals! Our server explained that this is not a combination of crudo, ceviche and tartare, but that one of the three would be offered as that day's special. 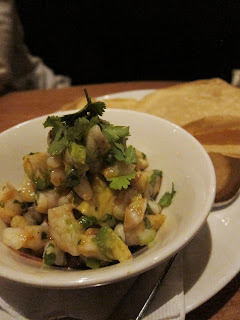 That night, a shrimp ceviche was on offer - and the intuitive flavorings turned out to be citrus and chipotle (?) plus cilantro. We love the juicy, tender but structured (i.e. fresh!) pieces of shrimp with the kick from what we think is chipotle. Last but not least, it's always exciting to see lamb on the menu, and Westside Tavern further uses it in their own reinterpretation of the classic French Dip sandwich, with their Mountain Meadows Lamb French Dip ($16) with Onion Marmalade, Horseradish Cream, Rosemary Au Jus, on a Soft Roll. The lamb slices were juicy, perfectly cooked and the bread was at the perfect ratio to the meat, skillfully toasted for a nice crunch while maintaining a soft, pillowy interior. The horseradish cream added light heat, counterbalanced by the savory-sweet onion marmalade, and rosemary au jus was served on the side for dunking as desired. All in all, we had an awesome time and chatted til closing, but was never hassled / rushed - and we were very happy that the meal + drinks totalled just $40 per person before tip. Though it was a rough start with the travel and long wait for a table, the drinks, food and attentive, friendly service to us made it all worthwhile. We left with full bellies, big smiles, and delicious memories (all thoughts of the stressful work week wiped from our minds) - and concluded that everything was definitely worth the (long) drive over, even during LA rush hour traffic. Things that would make this place even better: Happy Hour offering, and to finally take reservations. In any case, we will see you again soon, Westside Tavern! Date Night at The Americana at Brand - In case you missed it: Dinner + Movies + Valet for two @ $30pp Mondays - Thursdays at select restaurants at The Americana at Brand (ends 4/28/11). For reservations call 818.637.8982. Deal also available at The Grove. Malls are steadily looking to transform into more than just a place to shop. 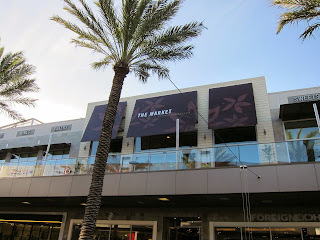 With complexes like Century City and Santa Monica Place at the forefront of the 'culinary evolution' - from aspiring dining experiences on rooftop terrace to high end food courts serving global fare - mall dining has its gaze firmly affixed on becoming more than mere utilitarian pit stops to refuel during marathon shopping sprees, but destinations /events that garner attention from gourmands. There is still a lot of work to be done before they can achieve that goal - but as someone used to experiencing fine dining in malls in Hong Kong, I for one am cheering on their efforts. 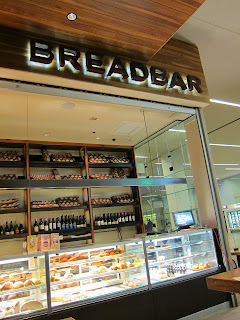 BREADBAR is one of the trailblazers, with its focus on "artisanal bread in the classic tradition of French breadcraft...inspired by the French bakers of past centuries, and updated with a contemporary American taste." Combining "tradition and innovation with a passion for good eating", Breadbar first made headlines with Ludo Lefebvre's game-changing pop-up concept at its 3rd street location a few years ago. It's since progressed to Hatchi guest chef series at its Westfield Century City location. The latest in the series, "Hatchi Truck Stop", featuring food truck chefs the last Thursday of every month, rolled into BREADBAR this past week. "Hatchi," which means 'eight' in Japanese, has the original idea of offering diners eight inspired small plates priced at $8 each as a one-night-only engagement, smartly driving 'urgency to try'. Guests have to order a minimum of 4 dishes each including alcoholic beverages. This needs to add up to a minimum of $32 (which is almost 'one unit of Mozza') - so I did look over the list of trucks carefully before making my reservation for opening night. The "gastrotruck" kicking off the series is Grill 'Em All, Food Network's "The Great Food Truck Race" winner. Grill 'Em All, helmed by Chef Ryan Harkins and Chef Mathew Chernus, is known for its rock 'n' roll persona backed by a menu featuring (I heard) incredible burgers and other comfort foods. I actually didn't watch the show and was drawn purely by the menu items described for BREADBAR's Hatchi Truck Stop opening night, which included such Pavlovian words as "truffle", "foie gras", and "poutine". A big fan of food trucks as incubators for up and coming talent, who just may not be funded yet to launch their own brick and mortar venues - I see food truck chasing as sometimes involving both an element of rooting for the underdog and the thrill / vanity of discovering new talent. 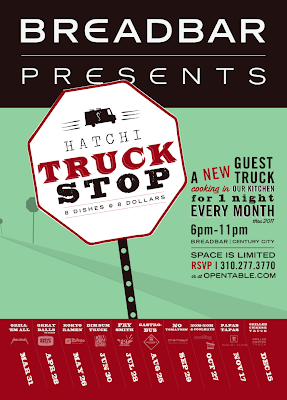 So I was excited about the Hatchi Truck Stop series, as it gives food truck chefs run of a full kitchen to exhibit their skills at producing higher end fare. Tucked in the back of Century City, by escalators leading to AMC Theaters, BREADBAR has a cosmopolitan vibe that you would expect to see in a bustling neighborhood in Manhattan or San Francisco. I loved that they went with modern / sleek vs. the expected rustic, in line with the traditional bread-making techniques they are marketing. "Designer" agreed to check this event out with me, and when we arrived Thursday night, we were promptly seated at the communal bar-height tables on the 'patio'. Menus were already waiting for us at each spot. To meet our minimum, we each ordered 3 dishes plus a cocktail. In terms of drinks, BREADBAR was featuring signature microbrews from Humboldt County's Lost Coast Brewery. Not a big beer fan, I went with the Elderflower St. Germain cocktail ($10), which unfortunately reminded me of what you would get if you hand-squeezed several moist towelettes into a glass, except the citrus is orange instead of lemon. Designer went with an interesting cocktail made of ginger beer, beer and fresh sprigs of mint ($10) - this was refreshing but not mindblowing and not something we would crave. 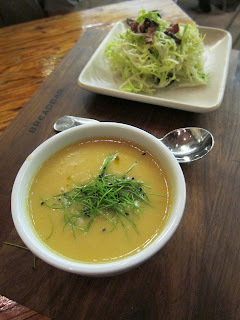 My first dish was Beer And Cheese Soup ($8) - with Frisee, Lardon, Bacon Vinaigrette. 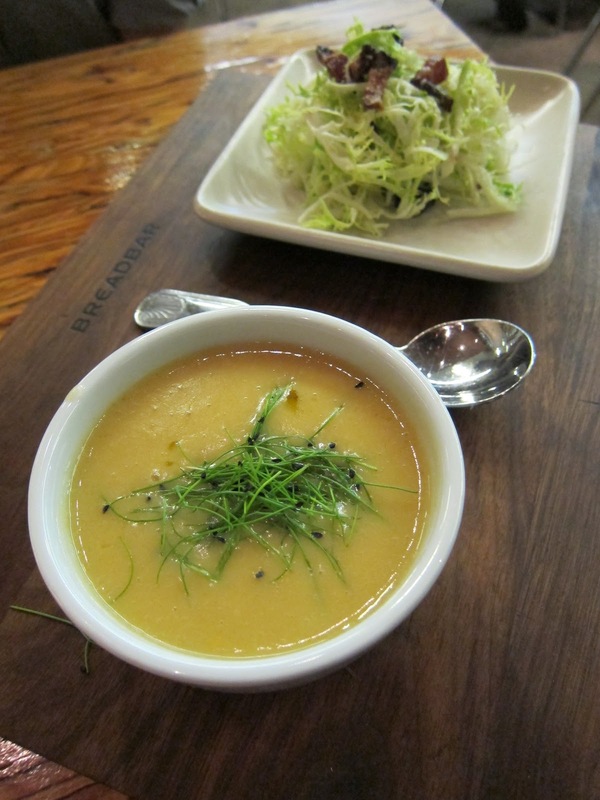 Seemed like the chefs were having fun with the traditional pairing of soup and salad. Beer with cheese in soup was a new combination for me and I was excited to try it. I did like this soup - which had an interesting consistency that was at once creamy and 'sticky'. The mix of savory and sweet was also interesting as well, and I love the quick toss of herbs on top for texture contrast. As for the frisee salad, much as I love bacon, this couldn't save the salad from being as washed out as an 80s' rock star. The bacon vinaigrette did not come through at all in taste, the frisee was barely dressed, and the lardon bits though tasty were also a bit on the dry side - so that the whole thing did not come together cohesively. I ended up just picking at all the bacon bits and leaving the rest. 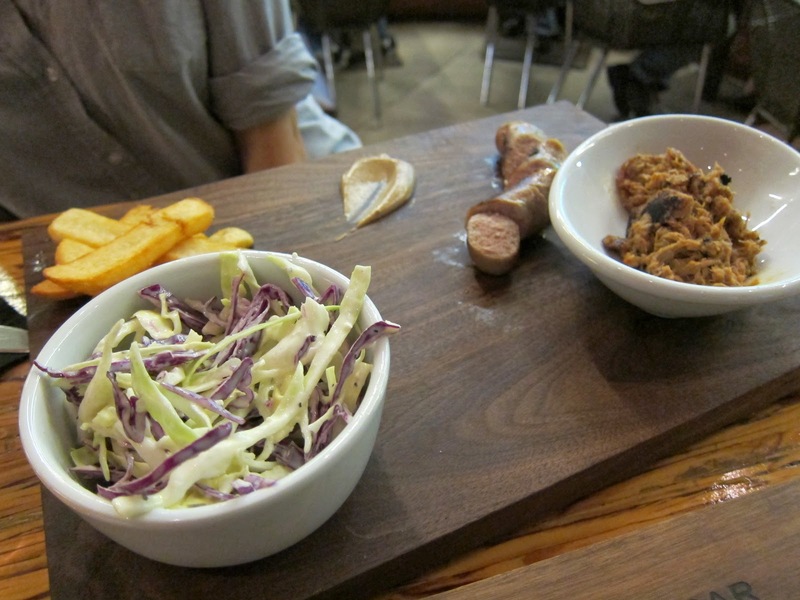 Designer's first dish was Deconstructed Cleveland Polish Boy ($8) - Wild Boar Sausage, Blue Cheese Slaw, BBQ Pulled Pork, Cleveland Stadium Mustard, Steak Fries. This was probably the most unappealing presentation of the night - I am not even going to repeat what Designer described it as, but it has to do with 'presents' you will often find on the sidewalk in neighborhoods with irresponsible pet owners. The pulled pork was actually incredibly juicy and rich in flavor, and possibly the best dish of the night. The rest of the plate fell flat on stage - the sausage, which had so much potential with its exotic sounding meat, was not exotic at all in flavor - there just wasn't much flavor to be had, period. The mysterious sounding 'stadium mustard' was also lackluster in the flavor department. 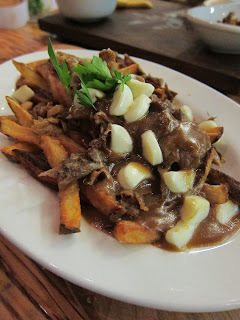 We both got the Poutine ($8) - Fried, Duck Confit, Gravy, Mozzarella based on the description. I've yet to take my brother up on his offer of an authentic poutine 'tour' in Montreal, but I've liked all that LA has to offer so far, and was excited to see this on the menu at the BREADBAR event. I liked this dish for the most part - the duck confit and gravy was rich, tender and flavorful - the fries served hot and crispy. My only note was for the mozzarella - I know that poutine by definition involves cheese curds, but the mozzarella bits had a consistency that was a bit too rubbery for our taste - they were just short of the rubbery-ness of little erasers on the ends of pencils. It would have been nice to get fresh mozzarella bits in as their own interpretation of the dish. A solid dish overall though, and a great deal - the portion size was generous and we could have eaten this as an entree. As it is, we were able to take leftovers home. 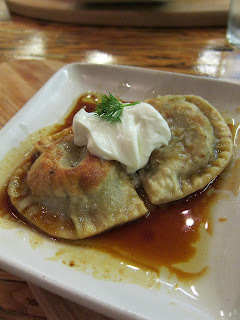 Based on the description, the dish we were most excited about for the night was the Pierogi ($8) - "Stuffed with Pate de Foie Gras and Portobello Crimini Mushroom, Truffle Sour Cream", which includes a few of my favorite foods / ingredients on earth! We *almost* spent all 3 of our required dishes on the Pierogi. Unfortunately, this turned out to be probably our least favorite dish of the night - the pierogi wrapper was thick, chewy and crusty on the edges, tasting like it came from a bag of frozen dumplings that has sat in the freezer far past its expiration date. Foie gras, best known for its luxurious, decadent, rich texture - did not have its signature features highlighted, but was instead a broken down, jumbled mess that is a mere shadow of its original state. There was neither richness of texture nor taste. The asian-inspired sauce was oily overkill, overwhelming any subtle flavors that might have been lurking in the pierogi filling. I thought at least that we could enjoy the truffle sour cream - but was disappointed when we found we could not taste any hint of truffle flavor in the cream. Even if we had room for dessert after all these dishes, we were too disappointed in the quality of our savory dishes to throw any more money into the meal. All in all, while I applaud in concept BREADBAR's support of up and coming chefs with these pop-ups, and will undoubtedly be back for others in future - this particular event with Grill 'Em All Truck was not what I had anticipated. And this out of all the food trucks listed is what I would most look forward to trying (I'm already addicted to Coolhaus and chase it down far too often). Knowing that Grill 'Em All Truck's specialty is really burgers - I would still be up to try one the next time they roll into my neighborhood, but as far as more ambitious dishes go - I would say they still have several miles to go before they get 'there', if that is even their goal.